A very special “Thank You” for a job well done. 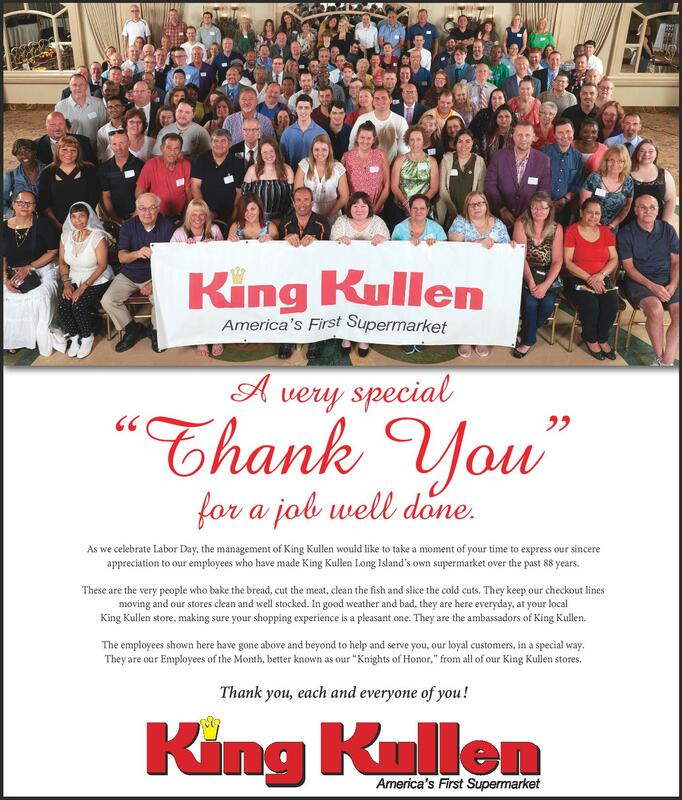 As we celebrate Labor Day, the management of King Kullen would like to take a moment of your time to express our sincere appreciation to our employees who have made King Kullen Long Island’s own supermarket over the past 88 years. These are the very people who bake the bread, cut the meat, clean the fish and slice the cold cuts. They keep our checkout lines moving and our stores clean and well stocked. In good weather and bad, they are here everyday, at your local King Kullen store, making sure your shopping experience is a pleasant one. They are the ambassadors of King Kullen. The employees shown here have gone above and beyond to help and serve you, our loyal customers, in a special way. They are our Employees of the Month, better known as our “Knights of Honor,” from all of our King Kullen stores. Thank you, each and everyone of you!